Tropical Ingenería is a company that provides professional services in consulting, engineering, auditing, and providing specialized solutions to customers within mining, oil, and infrastructure. The target was to measure resistivity values that could be associated with the presence of salt deposits or areas containing water with high salt concentration, and could serve as an indicator for the geological characterization of the area. The location is in a mountainous area of Colombia, which makes the use of conventional methods such as VES inapplicable. This supported the choice of using TEM as it can be effectively used in areas with irregular relief. The ABEM WalkTEM data quality is also well suited for high accuracy detection of areas with a high concentration of salt. “There are major benefits of using the ABEM WalkTEM on such surveys and its flexibility and speed allowed us to perform measurements at up to 10 sites a day in mountain terrain”. The survey results were consistent with the previous knowledge of the sites’ geology and therefore concluded a presence of salt deposits as well as water with high salt concentration. 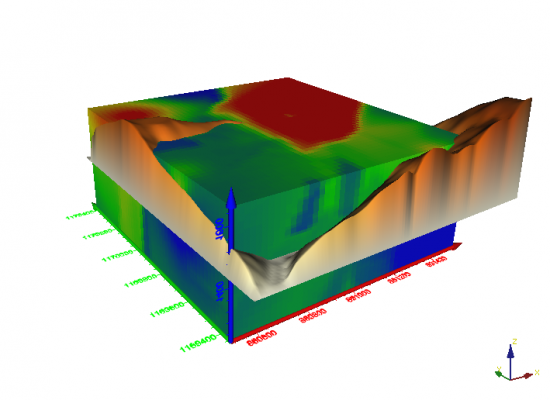 The data were further analyzed and visualized in a 3D model.